World War I brought with it the dawn of air-to-air combat. Of the many airplanes that saw action, only a handful actually became legends. The Royal Aircraft Factory S.E.5a was one of them. Flown by many of the British and American aces of the time, it was instrumental in regaining and maintaining Allied air superiority from 1917 through war’s end. 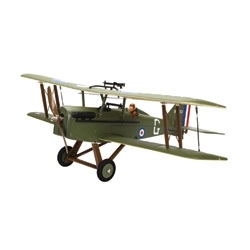 Now you can take to the skies with this outstanding sport scale recreation of the ParkZone® RAF S.E.5a. Its winning combination of scale realism and easy-going flight characteristics will capture the heart of everyone who loves aviation classics.